Years later, Jack has descended to a street hustler playing three-card monte. Gil has tracked him down and wants him to do one last job. He has new partners—Patricia (Blair Medina), a feisty, headstrong young woman with very good con artist skills and Yevgeny (Chris Bober), a taciturn Russian strongman—and wants Jack to join them. Cath (Patricia Sabulis) plays a neurotic, overprotective stage manager in the musical comedy Heist, by Alex Koceja and Michael Uselmann. Top: Jack (Alec Irion) and Chris (James Cella) have a dance-off to prove who's the better person. Photographs by Michael Kushner. The target is a valuable necklace worn by the star of a Broadway production, coincidentally titled 3-Card Monte. In order to get near enough to lift the jewelry, they must join the show, a fictitious musical classic from 1953 by Fiedler and Kane (an echo of The Drowsy Chaperone). “One Last Job” is the wonderful song in which Gil pleads for Jack to join him. Jack agrees. Alex Koceja’s book and lyrics may use familiar stereotypes, such as the flamboyant stage director and the impossible diva, but they are uproariously funny. Koceja, a throwback to golden age lyricists, excels at clean rhymes without strain, and composer Michael Uselmann provides enjoyable melodies that support them. All are strongly sung. Cella doubles as Miles, the flamboyant director, with great aplomb. He titters around the stage alternating between arrogance and despair. When the actors refuse to repeat the racist and sexist lines in Fiedler and Kane’s archaic script, Miles argues in “Authenticity” and refuses to change anything. Jack (Irion) sweeps Patricia (Blair Medina) off her feet, sort of, in the musical's reference to Kiss Me Kate. Cynthia (Claire Leyden, a classically trained soprano) plays the leading lady, whose talents have been miscast. The musical is a swingy, jazzy musical about love. She can’t restrain herself from hitting high operatic notes, making her numbers sound anything but swingy or jazzy. Love scenes come out hilariously stultified. She’s an impossible diva as well; she insists that the director rewrite sections so that she is included in more scenes. Also notable is Patricia Sabulis, who plays Cath, a neurotic and pedantic stage manager who browbeats management and union members with Equity rules. “I’m not just the stage manager,” she crows. “I’m the union representative. The last line of defense between chaos and Actors Equity.” But she, too, has hidden motives. Bober is also marvelous in his role as Yevgeny. He is ever-present and engaging, even with limited dialogue—a hard job on the stage. As a character, Yevgeny provides one of the biggest surprises in the play; when he reveals his story, it becomes a moral of sorts about tolerance and love. But the main themes are loyalty and friendship. It turns out Patricia is not who she says she is and is ready to double-cross the crew. However, along the way, Jake makes a convincing argument for friendship and loyalty. Will Patricia come around and learn to trust him? It's uncertain which way she'll go. The cast is rounded out by an ensemble of a few dancer/singers (Kable Barnhart, Chandler Converse, Javier Fox, and Alicia Thomas). Sonya Plenefisch’s costumes (she also did the set) extends the humor of each role. Miles wears black jazz pants, a T-shirt belted tightly at the waist and a 1980s-style mustache. Claire Leyden as the star of a Broadway show and Irion as her leading man take center stage in a musical revival in Heist! Choreographer Jenna Haimes uses the small stage skillfully, and there are some ensemble numbers that really pop. The two-man band, Uselmann on piano and John DeMan on drums, lend it a Broadway air by offering live music. At times, the young yet talented actors buckle a little under the strain of holding together such an ambitious work, but, all in all, Heist! 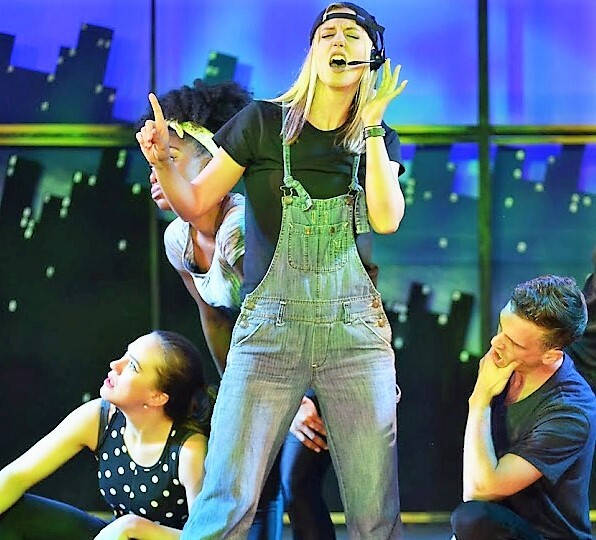 is an engaging musical with lots of humor and energy that will leave you chuckling and snapping your fingers well after you leave the theater. Heist! is at the Players Theatre, 115 MacDougal St. (between West 3rd St. and Bleecker St.) through Sept. 2. Evening performances are at 7 p.m. Thursday through Saturday; matinees are at 2 p.m. Sunday. Tickets are $32-$52. To purchase tickets, visit heistmusical.com.